Insistence on transparency and a non-partisan attitude have marked Navlakha’s work. 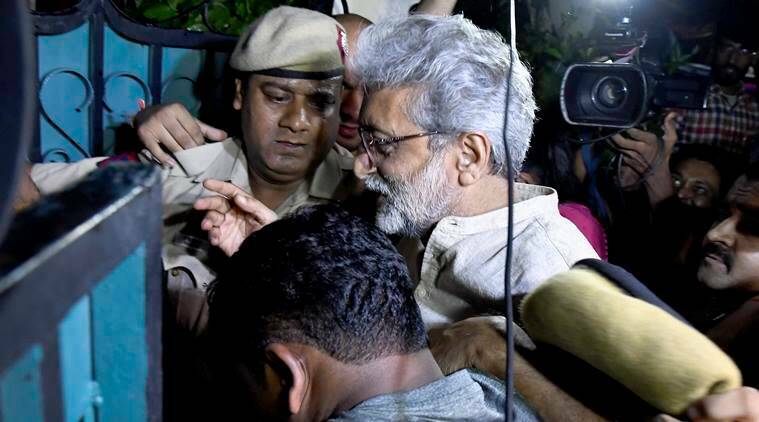 My friend Gautam Navlakha, who is under house arrest, has been accused of hatching a secret Maoist plot to kill Prime Minister Narendra Modi. I have known Gautam Navlakha for more than three decades now. If he can be accused of anything, it is his adherence to transparency, and abhorrence of secrecy. This must have been construed as a crime by the present rulers, who believe in a different set of values. They believe in covering their misdeeds under the opaque glass of draconian laws like the AFSPA, and Unlawful Activities (Prevention) Act (under which Gautam has been hauled up) which deny the citizens their fundamental rights. They prevent United Nations Human Rights Commission’s rapporteurs to visit strife-torn Kashmir. They resort to secret pacts with foreign business magnates and governments without disclosing their clauses to the public. It is this veil of secrecy that has been torn apart and the wall of opacity that has been broken down by Gautam, Sudha Bharadwaj and the other human rights activist friends of mine who are under arrest. For the last several decades, they have ventured into the hidden corners of the country where the state’s security forces suppress dissent and violate human rights, published reports exposing their atrocities and arranged legal defence for the rescue of the victims. As a member of the PUDR (People’s Union of Democratic Rights) and different fact-finding missions, I accompanied Gautam in many investigations and observed how meticulous he was in collecting evidence and objective in presenting his findings. In fact, honesty of purpose and a non-partisan attitude have marked the investigations of the human rights groups in India and earned them appreciation all over the world. It is important to remember in this connection that these courageous and honest individuals, who are today being accused of being partisan against the present BJP regime, have always been consistent in their defence of human rights, irrespective of the party holding office at the Centre. For instance, in 1979 during the Janata government, they came out in protest against the then ruling coalition’s failure to curb communal violence in north India. In 1984, they published an exhaustive report — ‘Who Are the Guilty?’ — under the auspices of the PUDR and PUCL (People’s Union for Civil Liberty), which exposed the role of the Congress in the massacre of Sikhs in Delhi. In 1990, a group of human rights activists visited Kashmir and came out with a report, ‘India’s Kashmir War’, exposing cases of human rights violations. In 1992, following the demolition of the Babri Masjid (when a Congressman, P V Narasimha Rao, was the prime minister), they set up a people’s tribunal to submit evidence about the role of the administration in the events in Ayodhya. Gautam played an important role in most of these investigations. He analysed the events from a dispassionate and critical viewpoint. He displayed this attitude when he went on a field trip as a journalist to the Maoist base of Dandakaranya, and came out with the excellently documented book, Days and Nights In the Heartland of Rebellion. While courageous enough to express political sympathy for the Maoists, he is unsparing in his criticism of their mistakes and crimes.